I thought the for a change last night I would not add paint to the 1/6000 ships mentioned in On the workbench – painting in progress as I did not have much painting time available and really, I wanted to give my eyes a bit of a rest. What could be better than to prepare some 2mm buildings for the Aeronef Peshawar project? For the curious, 2mm is approximately 1/900 scale which is about right working with the nominal 1/1200th scale of the Aeronefs and looks about right with the Land Ironclads stuff produced by Brigade Models. I had purchased a load of Brigade’s 2mm scale Middle Eastern buildings as well as some Irregular Miniatures Middle Eastern villages. I had been debating about how to handle these. 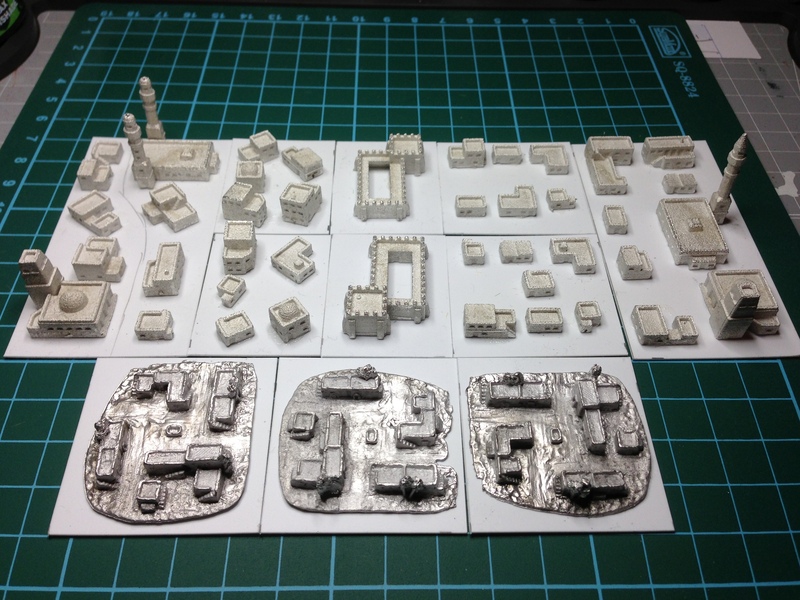 The Brigade stuff was absolutely going to have to be stuck to something as they were individual buildings (see 2mm terrain for how they looked fresh from the post office). I finally decided to try them glued to 20-thou Plasticard. I worked on 30mm, 40mm and 80mm sized bases. By basing this way I can set multiple separated bombing targets for the Aeronefs and Aerostats as small villages or larger towns. The ruled grid in the picture is a 1cm square grid. Back to the ships tonight – I want to finish painting them tonight and then spend time tomorrow labelling the bases, ready to post on Monday. Then I’ll out some paint on these and see how they look painted up.